Take out your red pens and get ready to correct my sweatshirt. Can you spot the grammatical error? Well, neither did I at first because I don't speak French. Apparently, the accent mark over the "A" in "à la mode" is backwards. This was news to me too. I purchased the sweatshirt for a steal during Banana Republic's extra 60% off all clearance items sale over the holidays. Afterward, I came across the reviews for the sweatshirt online and found that many Francophiles panned it for the accent mark mistake and refused to buy it. Their loss is my gain! I think we are all prone to grammatical mistakes from time to time, be it conscious or unconscious. I am an English teacher and occasionally I look at my blog and find mistakes. Should brands be held to a higher standard? Perhaps. I bought a Donald Robertson for J. Crew T-shirt that said "I like J. Crew Alot" on the tag. I cringed when I saw the grammatical mistake, but unlike the reviewers of the à la mode sweatshirt, I bought it despite its misspelling of "a lot". The tag is hidden, so no one will see the error in the case of the T-shirt. My hair can cover the accent mark on my sweatshirt, so I'm safe in case I should happen upon any French speakers! OMG that cobalt skirt is divine. Great sweatshirt also. Killing it as usual! Thanks Ada! I hope you are having a great week and soon to be weekend! Your skirt is gorgeous and I love it paired with the sweatshirt! Thanks Jill! This skirt is very versatile and a lot of fun to mix with different things. That's so funny! I would have never spotted that! 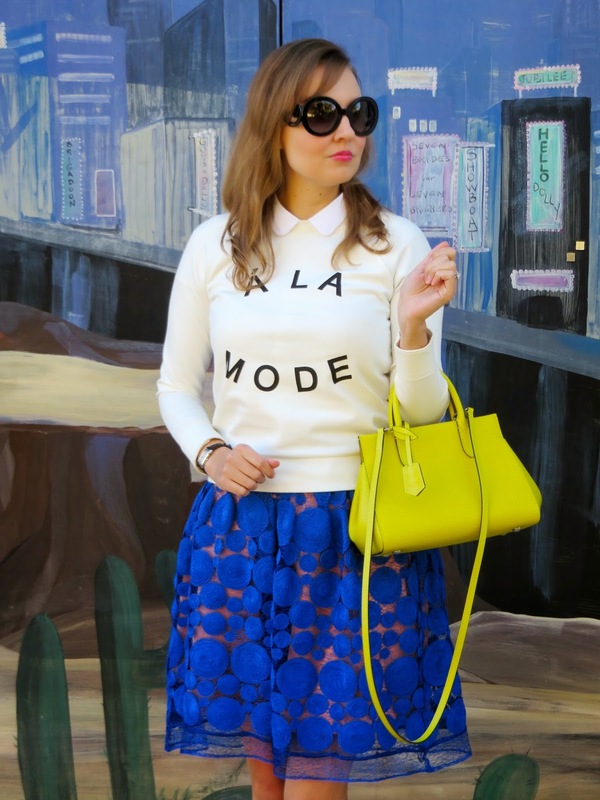 I love your cobalt skirt! So cute! I know! If you don't speak French you would never know. Even if I did speak French it's a pretty small mistake. Go figure! By the way, I am totally loving your skirt! Your outfit is perfect for this new weekly link up centered on skirts! Inviting you to link up here -- Skirtista Diaries. Hope to see you at the link up! I agree, as long as it's cute, I don't care too much! Plus I think 99 percent of people would have no idea. I would love to check out your link up- thanks! I would of never spotted that. I absolutely LOVE that skirt, really like the way you paired it with a sweatshirt. Thanks Melissa! This is one of my favorite "fun" party type skirts. It goes with so many different things. Thanks for stopping by! Haha! I don't think I would have caught that. So funny that you keep finding all these shirts with grammatical errors. 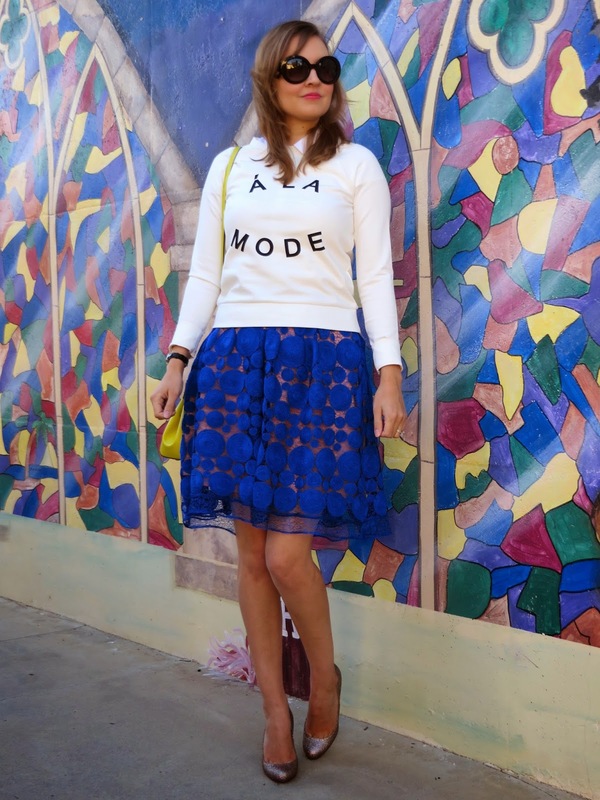 Such a pretty skirt - I'm so obsessed with cobalt right now as you can tell by our link-up today, hehe. I love it paired with that bright yellow bag! Yes, cobalt is such a beautiful color and I find that it goes with so much, especially yellow! Thanks for stopping by!